Pollution hazards are gift of industrialization and have been on the rise since World War II. Significantly large quantity of thousands of synthetic chemicals is flooding the environment every year, which threaten child health. Mounting pollution displays the over emphasized selfish instinct of human nature. We use the natural and technical resources for our benefits, but are neither bothered to clean up the mess nor hold the responsibility for the consequences that follow. low doses, the toxic elements prevalent in our ambient environment can have a significant impact on childhood development. We have succeeded in controlling infectious diseases, but have totally failed in maintaining a healthy environment for our children. Pollution hazards have therefore shifted the burden of diseases towards chronic childhood disabilities that leave their impact throughout the adulthood. The levels of toxins that were considered safe couple of decades ago are now linked to longstanding compromise of child health. Fetal basis of adult diseases: Many toxins, though insignificant when evaluated for adults, inflict long lasting effects on child health and into adulthood. The body concentration of the pollutants is much higher in children as opposed to that in adults. Childhood physiology and lifestyle make children more prone to accumulate the environmental toxins and to their toxic effects. 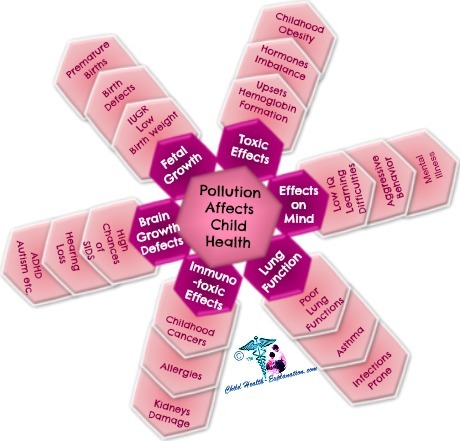 Why are children more susceptible to pollution hazards? As compared to adults, children intake more of the environmental toxins found in water, air, soil and foods. Moreover, the physiological capacity to degrade the imbibed toxins is yet under developed. The small size of children leads to higher concentration of toxins per unit body weight. Tender tissues: even the skin is more permeable to toxins. Respiratory immaturity: 80 percent of the lung alveoli are formed during infancy and the maturation of lung function continue through teenage. Though the damaging effect of air pollutants is most pronounced during early infancy, ambient air toxins jeopardize the development of respiratory functional capacity throughout the childhood. Consequently, as young adults, they fair poorly for lung functions. Children have higher exposure to most air pollutants as compared to adults. * High respiratory rate gives them higher minute ventilation. * Higher levels of physical activity. * Children spend more time outdoors. Children’s intake of water and food is more than that of adults, when calculated as amount taken per kilo of body weight. The habit of putting the fingers in the mouth, leads to children’s easy ingestion of chemicals/ heavy metals from the soil. 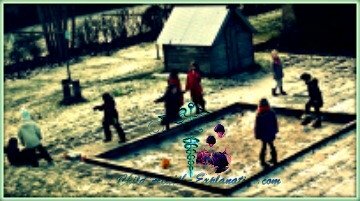 Habitually children play and move close to the ground. The metabolic pathways are not fully developed during infancy and early childhood. The capacity to metabolize, detoxify and excrete many chemical agents is immature. More Questions? Ask the Pediatrician & Get your Answers for Free! 2. Bad Ozone in the ambient air results from burning fossil fuels like gas, diesel, coal, and wood. 3. Depletion of the good Ozone up in the atmosphere that protects children from the ill effects of solar UV rays. Dumped industrial waste chemicals like mercury and radioactive compounds. Industrial effluents from textile, paper, food and metal industries. "Run-off" of nitrogen from fertilizers and pesticides used in agriculture. Deforestation lead soil erosion in to river beds.